I enjoyed my first IFIC experience over the past few days in Vienna, and thought I’d share some reflections. I found the pro-con debate between Dr Michaal Borg and Prof Gary French on whether we need more evidence to improve infection prevention and control useful. (Clearly, my vote was for Prof French, my PhD supervisor and all-around acadmic mentor.) Prof French gave a good case for an evidence-based medicine approach to IPC, bemoaning poor-quality evidence to support IPC interventions and an over-reliance on ritual and tradition. Although decent IPC study designs are tricky (and tricker than for an antibiotic trials), they are possible, as illustrated by the small number of cluster RCTs we have at our disposal. Dr Borg argued convincingly that, even if cluster RCTs support on intervention, they would likely be performed in high-resource, academic teaching hospitals, which are a different plant to the average hospital so may well not be applicable. Furthermore, clinicans are pretty poor at following guidelines even if they are evidence-based because culture eats policy for breakfast! Michael questioned whether the ‘English MRSA Miracle’ was founded in evidence-based medicine, or a pragmatic multi-faceted intervention. On balance, the room sided with Michael, agreeing that we have enough evidence to make a big different (but all agreed that better quality evidence wouldn’t hurt)! I also enjoyed the other pro-con debate between Reflection’s very own Prof Voss and Dr Wechsler-Fordos on whether antibiotic stewardship programmes reduce cost or antibiotic resistance. Andreas began by arguing that antimicrobial stewardship cannot actually reverse resistance, but instead reduces the emergence of resistance (or perhaps stops antibiotic exposure unmaksing omnipresent resistant bacteria). Andreas put together a convincing case based on several randomised studies showing no impact on rates of resistance but demonstrating substantial cost savings. In response, making reference to both Paul Ehrllich’s (‘‘Drug resistance follows the drug like a faithful shadow’’) and Sir Alexander Fleming’s predictions of resistance, Dr Wechsler-Fordos illustrated a clear correlation between antibiotic use and antibiotic resistance. She used a remarkable study from the 1970s to show that stewardship in its starkest form (stopping ALL antibiotics) reduces resistance! And there is evidence from more recent studies that reducing antibiotic usage reduces CDI, which just makes sense given the pathogy of CDI in particular. Furthermore, stewardship has other benefits too (besides cost) in reducing mortality and nephrotoxicity. So, although Andreas got my vote (obviously), he was onto a bit of a loser with this one! Martin Kiernan and I had back-to-back ‘Favourite Papers’ sessions on Catheters and Environmental Decontamintion, respectively (I had the tricky challenge of following MK – and yes, you did over-run!). Although not mentioned here, I was reminded of MK’s classic Catheter’s Lament! It’s fair to say that urinary cathether are very much the poor relation of veneous cathethers in terms of research and focus – but in some ways, no less important. There is some new guidance on acceptable uses of catheters (and nursing / patient convenience is NOT one of them!). I was particularly keen on the idea of using catheter utilisation as a proxy for CAUTI because it is so challenging to measure accurately. The key principles from my session on environmental decontamination are covered in this review. I love the concept (if love is the right word) that your hospital room can make you sick – and there is now a meta-analysis to prove it! I highlighted the recent discovery of biofilms on dry hospital surfaces, and how this may change the way we think about cleaning and disinfection in hospitals. I touched on a couple of different ways to reduce shedding of pathogens into the environment, such as choosing therapies associated with less shedding, implementing antimicrobial surfaces, or using daily chlorhexidine bathing for source control. Then, I looked at a few impressive intervention studies demonstrating that disinfectant wipes, and automated room decontamination systems can reduce the rate of acquisition of key pathogens. Finally, I presented the idea of seeding the hospital environment with spores to reduce the level of contamination with pathogens (not a good idea for the reasons outlined here). You can download the slides from ‘My favourite papers in…environmental decontamination’ here. Prof Hajo Grundmann gave a thought-provoking lecture on transmission networks for hospital pathgens. Hajo began by reflecting how much easier it would be only germs were visible, and effects of transmission were instant (like the Jos Verstappen pitstop fire)! Hajo considered in-hospital transmission networks and transmission, and between-hospital transmission networks (no hospital is an island). Hajo spent most of the time discussing data from the NHS data warehouse, illustrating how massively connected the NHS is, with each of the 16m or so admissions only 4 degrees of sepeation from one another in the context of tight local networks. The take-home from this is clear: we need to think and work regionally to deliver effective infection prevention and control. Finally, MK, Prof Peter Wilson and I gave a session on controlling resistant Gram-negatives, questioning whether the horse has bolted and it’s too late to close the stable door. I set the scene and gave an overview of the complex microbiology of resistant Gram-negatives (including the confusing, unhelpful proliferation of TLAs)! I also discussed the potential new insight that whole genome sequencing can bring us in understanding the transmission and epidemiology of CPE. (You can download my slides here.) Peter Wilson then asked whether we can turn back the tide on the progressive increase of ESBLs in Europe. There are some success stories, which give some hope. But given the complexities of multiple reservoirs (surfaces, taps, food, animals – all of the above? ), and a poor evidence-based for interventions, turning back the tide will not be easy. Finally, MK discussed the very real prospect of “no room at the inn”, when we run out of isolation facilties. Given the limited stock of single rooms in UK hospitals (and in most hospitals worldwide), some difficult decisions need to be made when deciding who gets priority for the available room. Should a CPE colonized patient trump a patient with active C. difficile infection? Probably not. But who “wins” a single room when you have a CPE and a carbapenem-resistant Acinetobacter baumannii on the ICU? I suspect your local epidemiology will answer that one! MK’s talk is neatly illustrated by the image below. 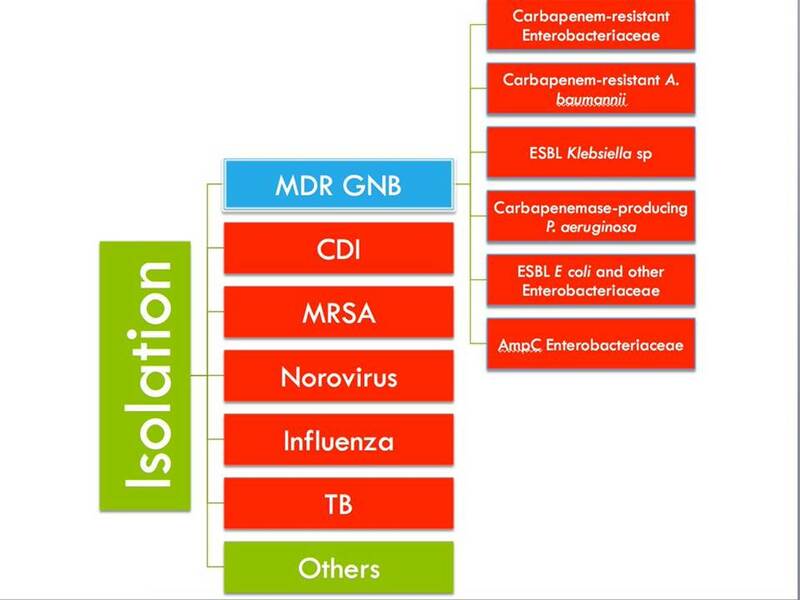 Image: Martin Kiernan’s isolation priority matrix. So, all in all, a good introduction to IFIC. Thanks to all the hard work from the organisers, and I look forward to the next IFIC. ← What are we doing to improve hospital room cleaning and disinfection? I love the phrase “culture eats policy for breakfast”!! That is totally and utterly true…My Doctoral research is an ethnographical study, immersing myself in ward culture and it’s effect on IPC practice. Particularly interested in domestic culture. An integral part of the team…Hospital rooms can make you sick…we are reliant on domestics to comply and engage. Fascinating, how do they see their role/value and what about other members of the team. Completely agree. Esmita at Imperial is doing some similar ward-based enthnography around antibiotic prescribing and finding similar issues. Domestic staff and under-valued and under-paid, no doubt about it. And yet I have worked with many incredibly dedicated domestic staff! I think this section of our workforce needs a collective promotion. Brilliant resume`, Jon and thanks for the complements. We are very grateful to you, Martin & Andreas for taking the time to all join us at IFIC2016 and delivering such excellent presentations. Meetings such as these highlight the many different challenges we face on a daily basis – with behaviour change being the greatest one of them all (sorry, I could not resist). Tremendous conference – well done to you and all involved in putting it together.